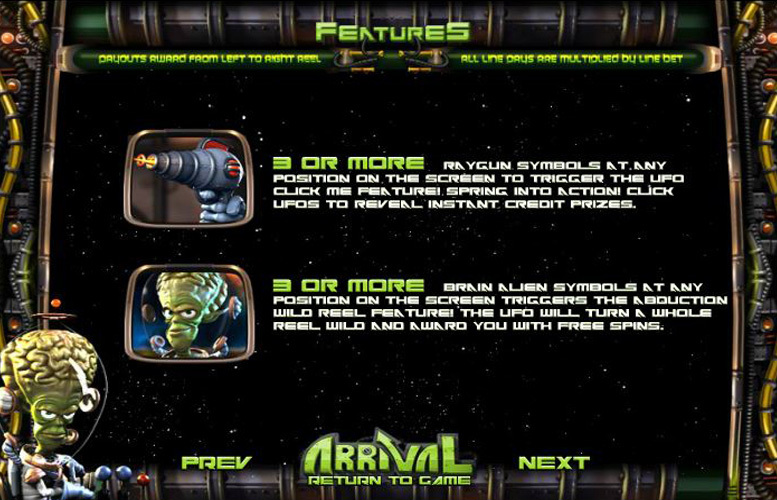 Arrival is a slot from BetSoft that’s all about fighting crime. It’s not your standard cops and robbers theme though. All the action is set in deep space. Cue criminal abductions, and law enforcement spaceships. It’s a visually strong game, as you’d expect given the designers behind it. However, it does kind of lack in the features department. In addition, some of the drawbacks of other BetSoft games are also present within the title. Whilst it’s certainly not the company’s finest work, it’s not a bad effort either. Visually impressive. We’ve come to expect a certain quality of presentation from BetSoft games. Arrival does not disappoint here. There doesn’t feel like quite the same level of detail has gone into the side games as has on many BetSoft games. They’re not bad bonus features but they’re not as memorable as its peers. The game suffers from low base game jackpots as well as a small upper betting limit. These issues affect many of BetSoft’s offerings but are usually made up for in the feature department. This isn’t the case on Arrival. Police spaceman = 400x line bet. Alien = 300x line bet. R2D2 lookalike = 200x line bet. When played on the highest bet level the top jackpot is 10,000 coins. Landing three or more ray gun symbols in any position will trigger the UFO “click me” feature. Selecting the different UFOs will win instant prizes. These are credited at the end of the feature. Landing three or more brain alien symbols anywhere on the reels will trigger the “abduction wild reel feature”. 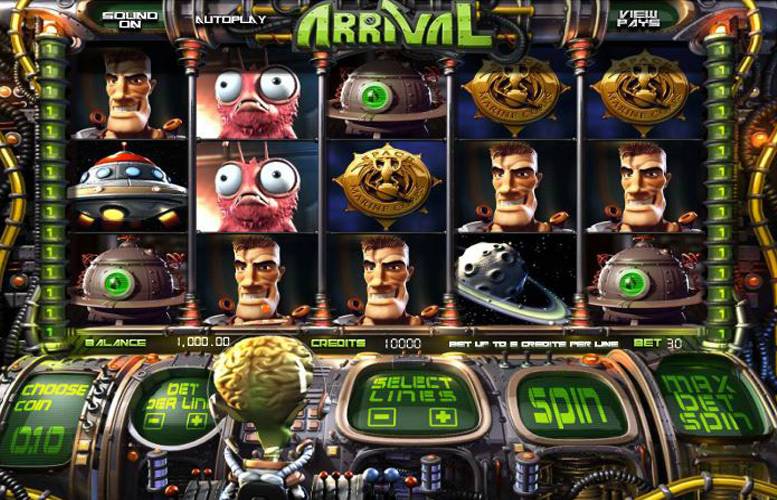 During this mode, the UFO will turn a whole reel “wild” and award players with free spins. Landing three or more female space police officers anywhere on the reels will trigger the Bonus Round. Our friend and fellow marine has been abducted by the Brain! 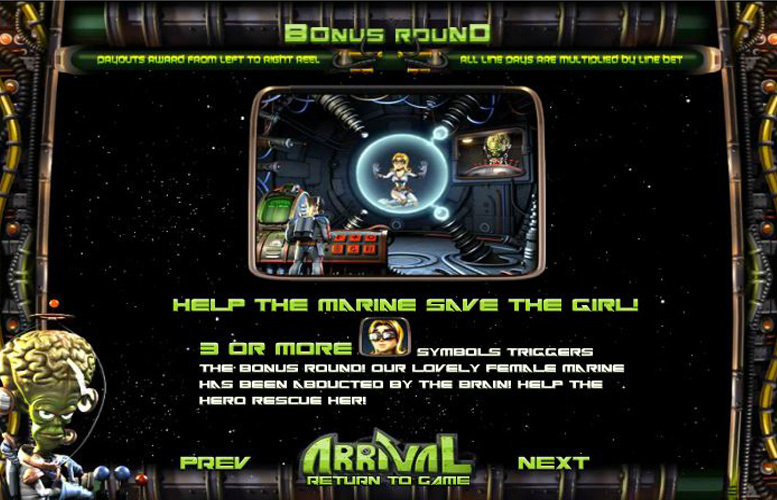 Help our hero rescue her by selecting options from the control console. Space ship = 150x line bet. Planet = 125x line bet. Badge = 100x line bet. Alien tech = 75x line bet. Radar = 50x line bet. 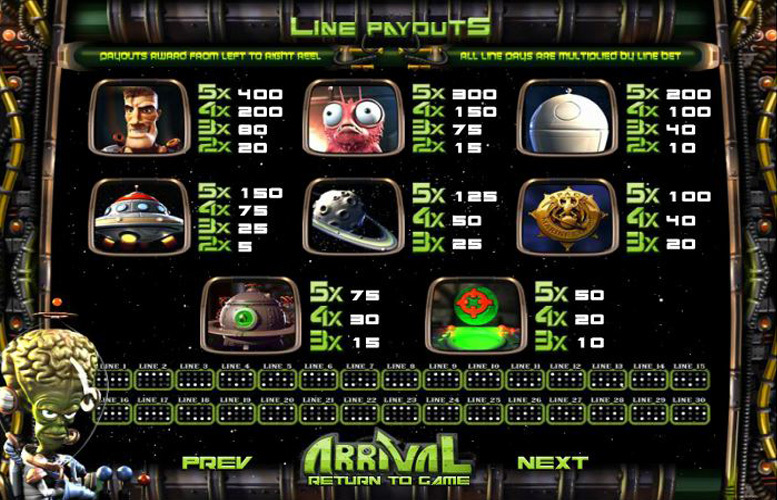 Players are given absolute control over how they distribute their bets on Arrival. They can adjust the number of lines waged upon (between one and 30), and the number of coins bet per line (between one and five). In addition, they can also set the value of each of these coins. The maximum here is 50p and the minimum is just 2p. This means that if all values are set to the minimum, the lowest possible bet per spin on Arrival is just 2p. Meanwhile, with everything maxed out, the largest possible wager is £75. As is the case with most BetSoft games, high rollers aren’t really catered for on Arrival. All told, we’ve come to expect a bit more from BetSoft than we’re presented with on Arrival. It’s no doubt a strong looking game. It just doesn’t deliver in the feature department. Many other titles from this manufacturer feel like every detail has been carefully planned and these games focus primarily around their thematically relevant features. Unfortunately, Arrival’s extra features feel a bit like an afterthought and don’t really add much to the replay value. It does also suffer from a few of the same issues that many other BetSoft games do – namely the low main game prizes and betting limits. This game has a rating of 3 / 5 with 495 total reviews by the users.